In the hierarchy of Disney weekday afternoon cartoons that we 80s children grew up watching, DuckTales occupies the top spot. It’s the web-footed king, and this is undebatable. Below that, you may find Darkwing Duck and Chip ’n’ Dale: Rescue Rangers, and below those are TaleSpin, Goof Troop and Gummi Bears. And then there’s Bonkers, a strange cartoon starring no established Disney characters and airing late in the lives of the original DuckTales crowd, thus preventing us from wholeheartedly embracing it the way our younger selves might have. But this is about Bonkers. I never liked Bonkers. Even as a kid, I thought it was grating, and the theme song may quickly lead you to the same conclusion. That doesn’t mean there aren’t a few bits here. 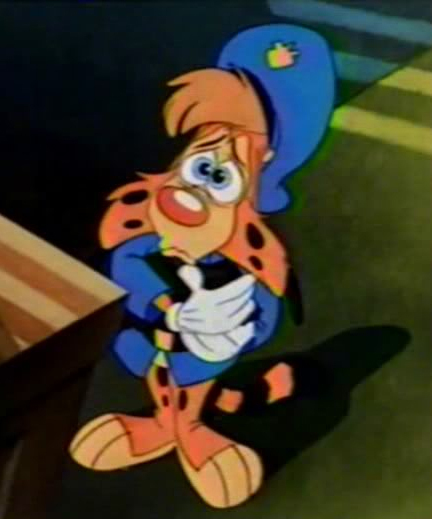 First, even though it came out six years later, Bonkers was very obviously inspired by Who Framed Roger Rabbit?, what with Los Angeles crime being committed and investigated by humans and the cartoons who live alongside humans. (On Bonkers, the humans themselves were animated, so the distinction wasn’t so clear. But still.) Even beyond that, it was a very meta show. We’re told, that this cartoon bobcat joins the police as a result of the end of his career as an animated star. And though the show was conceived of as being about an out-of-work cartoon actor, Disney purportedly went back and filmed Bonkers shorts showing his “acting days” in retroactive promotion of the show. He wasn’t anyone. He hadn’t become a thing yet. And he basically never would, despite Disney’s best efforts. But eventually he’d resort to being a cop on an afternoon cartoon show. If you’re talking about Bonkers in the scope of TV and cartoons, however, the thing that most bears mentioning is this: It seeminlgly got retooled, mid-series run. Much like a sitcom that revolves around a successful lead character but whose supporting cast gets cut — Dawnn Lewis, you were the best thing about Hanging’ With Mr. Cooper! — Bonkers lost its entire supporting cast, even though it’s a cartoon and therefore would have been more accommodating to tweaking and refocusing than a live-action show would have. But yeah, halfway through the series, Bonkers’s slovenly, Sipowicz-y partner, Lucky Piquel, joins the FBI and leaves the show, and when he goes to Quantico he takes not only his wife and daughter but also most of Bonkers’s cartoon friends. Then for the remainder of the episodes, Bonkers is partnered with an attractive female cop, Miranda, and his supporting cast consists of the characters who appeared in his original animated shorts. I’d always wondered what prompted a cartoon show to “recast” all its entire supporting players. This week, I found out. As this blog illustrates with the above clipping, Lucky Piquel wasn’t the original partner featured in the show’s concept art; Miranda was. According to the -plagued story being spun on Wikipedia, Miranda showed up late in the series because when the original Bonkers episodes were finished, higher-ups at Disney didn’t think it worked and ultimately called a new creative team in to fix it. Their solution was Lucky Piquel, and these episodes ended up comprising the “main” series, with the Miranda episodes getting tacked onto the end even though they were filmed first and even though the featured an older character model for Bonkers. In fact, according to Wikipedia, only nineteen of the Miranda episodes made it to air, meaning that someone somewhere is sitting on a whole stash of unaired Bonkers that no one wants to see. In order to explain Lucky’s exit and Miranda’s entrance, a transition episode was filmed, but even that’s complicated and weird. It dealt with a firebomber, a post-Oklahoma City, post-9/11, Disney stopped airing the episode, so all seven of the kids who were trying to watch the series run of Bonkers, beginning to end, would have had no explanation for why the show’s cast would suddenly change from one episode to the next. I mean, not that the actual explanation makes it all seem more logical. Anyway, that, my friends, is why Bonkers is weird. ... Because the world needed to know, that’s why. I remember watching Bonkers back in the day, and while it wasn't a good show by any means, I will say the Lucky Piquel episodes were more enjoyable than the Miranda ones. I guess Disney was right, although they wouldn't have lost much by not airing the show at all. Yeah, Miranda was bland. In defense of her existence, however, Wikipedia notes that Disney folks used the Miranda/Bonkers relationship as a model for Goliath's relationship with Elisa on Gargoyles. I can kind of see it. I wonder if Bonkers vs. Bubsy fanfic is a thing. By which I mean, I refuse to Google and learn that it is a thing. Fanfic and slashfic both, I'm sure. Throw some Marsupilami in there two, you perverts. I sort of liked the show, though admittedly more for the human characters than Bonkers himself. I think that may have been a result of them making Bonkers especially toony to highlight that he was something different than the human characters. Is no one going to ask how he can be a bobcat with such a long tail? I guess that goes without saying. I did appreciate some of the Disney character cameos on Bonkers, like Ludwig von Drake and the Mad Hatter and March Hare. Re: the tail, this is a point that the world probably hasn't considered. The cameos were a nice touch, but I'm a sucker for meta. 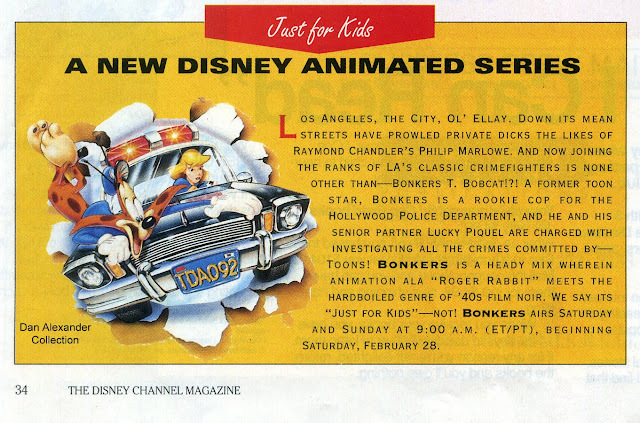 I believe Bonkers wasn't just inspired by "Who Framed Roger Rabbit," it was supposed to be the Roger Rabbit the animated series. But they ran into legal troubles and therefore had to put the show on the back-burner, ultimately deciding the only way they could move forward was to create all new characters. That's why the two are so similar, and why there is such a long gap between the movie and the show. You know, I could have sworn I'd read that years ago. I just didn't find it anywhere in poking around for this post. Hey Drew! When I was in high school (when these Disney shows were airing for the first time on TV) I was pen pals (when that was a thing) with an artist at Disney TV Animation. Yes, the top brass did not think that the Bonkers/Miranda episodes were funny enough, so the show was "re-tooled." Not that the Lucky ones were much of an improvement... Allegedly the Miranda episodes were "tweaked" (not to be confused with "twerked") from their original Disney Channel run, though I did not notice any difference. "... meaning that someone somewhere is sitting on a whole stash of anaired Bonkers that no one wants to see." I want! I want to see 'em - and I will! Since even The Sweatbox (a documentary done by Sting's wife about the troubled production of Disney's The Emperor's New Groove aka Kingdom of the Sun, a documentary of which Disney didn't want that it sees the light of day again) made it into the internet, also the dismissed. Bonkers episodes will show up one day.